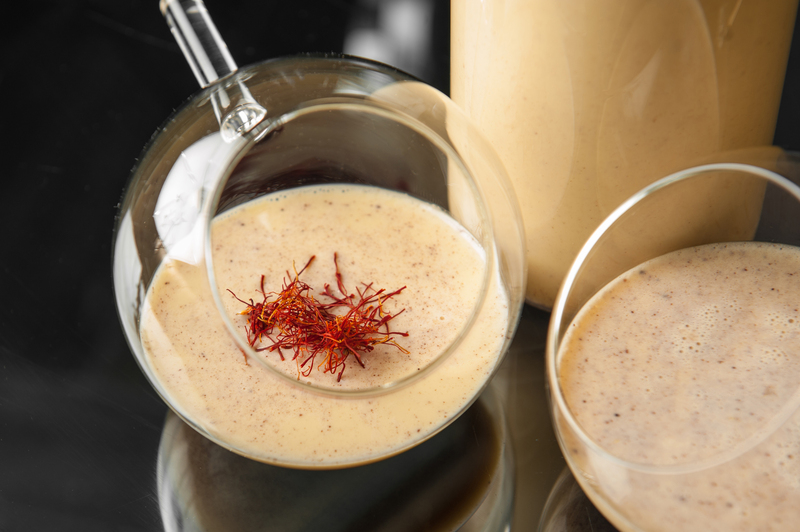 Instructions For the Eggnog: In a bowl of a standing mixer, beat the egg yolks until colors lightens. Gradually add the sugar and mix until sugar is completely dissolved. Then add , milk, cream, vanilla, salt, cinnamon, nutmeg. Mix thoroughly for 2 minutes. Last add egg whites and mix on high until thick foam or peaks appear. Store in refrigerator. For the cocktail: I like to keep the booze and the eggnog separate until I make someone a cocktail so if someone doesn't care for any alcohol or wants one a little stronger than most you can accommodate everyone. That being said, I typically use 1.5- 2 ounces of Vida Mezcal per person in a mixing glass with ice and 4 ounces of your homemade eggnog. Stir, then strain into glass and garnish with a pinch of saffron threads.